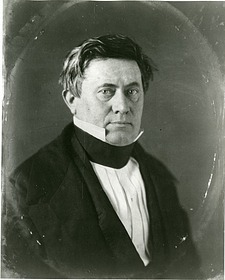 Joseph Henry became the Smithsonian's founding Secretary in 1846, long before such agencies as the Food and Drug Administration and the National Institute of Standards and Technology were established to provide scientific input on federal policy. The demands of his new role prevented Henry from continuing to pursue his own research; instead, he became the government's chief scientific advisor. He also worked to ensure that science was supported by the government, but not compromised by politics. Henry expressed his disapproval of congressional meddling in scientific matters they didn't understand well before he came to Washington, DC to lead the Smithsonian. In an 1838 review in the Biblical Repertory and Princeton Review, he protested a favorable report by the Senate Naval Committee on a new theory of terrestrial magnetism, noting that the committee had no scientific knowledge of the subject and that the theory made no sense.1 In a letter to his friend and colleague Alexander Dallas Bache, Henry called the affair "a disgrace to the country" and dreaded the distribution of the committee's report abroad. 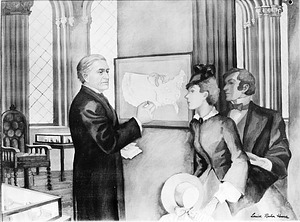 Henry became more active in urging that science be conducted independently of politics upon his appointment to the Smithsonian, developing a "Programme of Organization" for the institution that emphasized original research and high scientific standards. 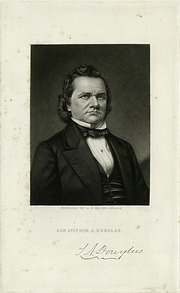 Henry saw basic research as central to the Smithsonian's mission, and publicly defended this position in an 1852 exchange with Illinois Senator Stephen A. Douglas, who had suggested that a new federal department of agriculture be attached to the Smithsonian. 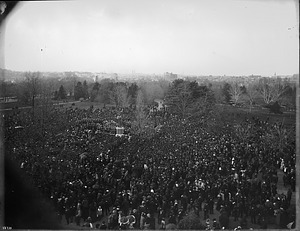 In response to Douglas's charge that the Smithsonian was wasting money on studies that lacked "practical results," Henry responded, according to a contemporary newspaper account, "that agriculture is to be more advanced by the microscope than by the plough and harrow." He sarcastically commented that Douglas's criticism might be valid "if the highest cravings of the human soul were confined to the desire for good potatoes ." Henry used his stature and, as Smithsonian Secretary, his relationships in Washington, to advocate for the appointment of accomplished scientists to federal agencies and projects requiring scientific expertise. "The position of your institution as scientific adviser to the Government is becoming assured," wrote Henry's friend and Harvard professor Asa Gray in 1852, "and will be productive of excellent results." Henry had earlier described the selection of university professor Alexander Dallas Bache to head the US Coast Survey in 1843, as a victory for "real working men" of science,3 and worked to increase the Coast Survey's visibility by writing a review of its work for the Biblical Repertory and Princeton Review; it was later distributed to members of the US Congress.4 When Bache died in 1867, Henry successfully lobbied for the appointment of Harvard University mathematician and astronomer Benjamin Peirce to succeed him. After convincing the US Treasury Secretary to nominate Peirce, Henry urged Peirce to accept the position, so the agency would not "be ingulfed [sic] in the vortex of partizan [sic] politics." Henry expressed similar concern that the Smithsonian, once he was no longer in charge, "may fall, as the agricultural department and the Patent office have done under political sway and the director be changed with every change of administration." 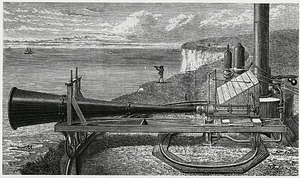 In 1847, Henry successfully in convinced the Secretary of the Treasury to include geomagnetic observations in geological surveys of federal mining reserves. He also persuaded the commissioner of the General Land Office to have his surveyors make observations on the variation of the compass in the course of their surveying. Henry proudly described both of these accomplishments in a letter to his wife Harriet, who had not yet joined him in Washington. "I find I can here do a good deal for the cause of american science," wrote Henry of his new role as Smithsonian Secretary. 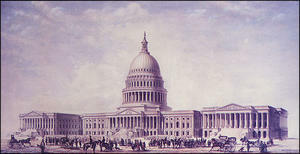 After moving to Washington, Henry continued to advise the government on a range of issues, including protecting the Capitol Building from lightning, and the construction of the Capitol extension . 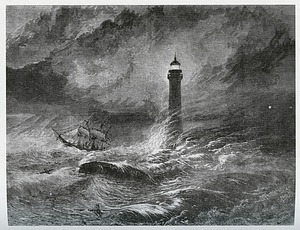 For the Treasury Department, he evaluated a new lamp for lighthouses,15 and for the Patent Commissioner, he weighed in, on whether a new discovery regarding the application of a known chemical was worthy of a patent. 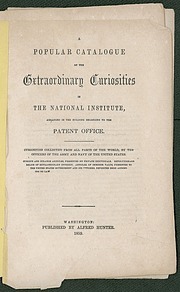 Henry was consulted by Congress on another patent case in 1855 after the government refused to pay a patent-holder for the Army and Navy's use of ether for anesthesia. 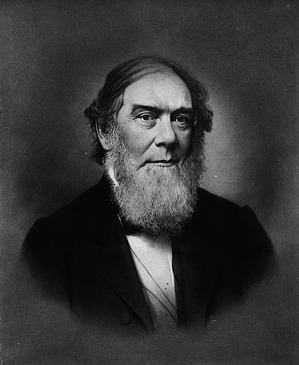 He also advised Secretary of War Jefferson Davis in 1856 on the potential for manufacturing niter, an essential element in gunpowder, should natural sources become scarce. 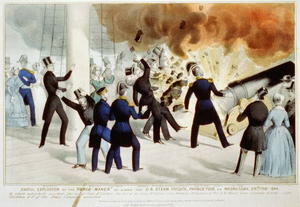 In 1863, Henry was named to the Permanent Commission of the Navy Department, a newly-established three-member board charged with reviewing hundreds of proposals for warship designs, signaling systems, torpedoes, underwater guns, and other ordnance proposed for use in the Civil War. 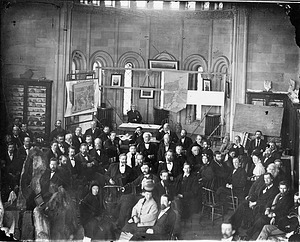 Robert V. Bruce, The Launching of Modern American Science, 1846-1876, Chapter 14. A. Hunter Dupree, Science in the Federal Government , Chapter 4.